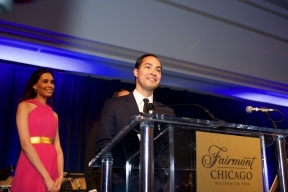 The Honorable Julián Castro, Congressman Joaquin Castro (D-TX) and their mother, Ms. Maria del Rosario Castro received the Arthur R. Velasquez Award for outstanding and civic service from the National Museum of Mexican Art (NMMA) at their annual Gala de Arte in Chicago on Friday, May 8th at the Fairmont Hotel. The Castro’s are San Antonio, Texas natives and have received wide acclaim for their political accomplishments and commitment to education, public service and community engagement. Ms. Maria del Rosario Castro is a long time community organizer in Texas and raised her twin sons, Julián and Joaquin, with the belief that through education, anything is possible. Both sons earned degrees from Stanford University in 1996 and each pursued a Juris Doctorate from Harvard Law School in 2000. Upon completion of their advanced education, the Castro twins returned to San Antonio to serve the communities they grew up in. The Honorable Julián Castro was appointed to serve as the 16th Secretary of the U.S. Department of Housing and Urban Development under President Barack Obama on July 28, 2014. Congressman Joaquin Castro served ten years in the Texas State Legislature, and in 2012 was elected to the U.S House of Representatives in Texas Congressional District 20, which is the main congressional district for San Antonio and Bexar County.